All divans and mattresses made in the UK. 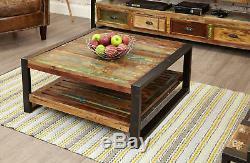 Urban Chic Reclaimed Wood Coffee Table With Shelf Storage Large Steel Frame. Reclaimed Wood, Solid Steel Framing - Urban Style. Each Piece is Unique - Hand Crafted. This unique contemporary square coffee table is part of the exclusive Urban Chic range. It is made using reclaimed wood salvaged from places such as Gujarat, Maharashtra and Rajasthan Southern India. Some of the wood used can range between 50 and 150 years old and is assembled by skilled craftsmen who create this colourful and interesting furniture. As each piece in the range is hand finished using a unique blend of reclaimed timbers, every item is truly individual. This unique piece has a large open shelf underneath to store away magazines and newspapers. A beautifully made steel outer frame gives a fantastic urban edge and offers great structural rigidity. The wood is finished with a resilient satin lacquer which is hard-wearing yet emphasises the beautiful colour and character in the timber with exceptional build quality - designed to last a lifetime. A time window will be provided by our courier. Remote area 2 surcharges applicable to; AB, DD, IV, KW 1-14, PA 21-38, PH 1-26, 30-41, 49-50, PL, TR, and TQ. Our couriers do not deliver to: Scottish Islands, Isle of Wight, Isle of Man, Channel Islands, Northern Ireland, and EIRE. Refuse the order, or 2. Accept the order and sign as unchecked making sure you and the driver take a photograph. This will cover you in the eventuality where the product may be damaged inside. We will then ensure a part or full replacement is arranged. These are the least visited or difficult to reach areas for our courier. Why not browse the rest of our living room furniture - we have individual and complete matching ranges. Take one look at our business logo, and youll see what we mean. Its simple artistry is a shining spotlight to our creativity. Thats how strong relationships last between people. We are perfectionists: we want to be the very best in everything we do. You deserve only the best service. Thats why youre in the right place. Your shopping journey doesnt deserve to end abruptly (it makes us feel bad), it deserves a happily ever after (with sequels in visits of course). Please get in touch we promise we wont bite: even if its a midnight message. Well most likely try lightening you up with a friendly chat. It can take at least 4 to 8 weeks for your body to adjust and mould into your new mattress. If you change your mind and decide to return your order, you may. Ask us to arrange the collection at a cost to you (charge will vary dependant on product): this is the safest method as all liability is on us, or. Arrange it yourself , however you are liable for the return of the product: this must be unopened, in pristine condition and sent via a trackable service. 14 days after the date you provide proof of return. If you believe a price is incorrect or looks disproportionate, please message us and well provide further information. Please note that if you place an order and in the unlikely event the price was incorrect, we reserve all rights to cancel your order (this is normal practice). For this reason, we no longer send stock alerts or reminders to customers. We believe this information is correct and reliable, free from any misleading information. But there are rare occasions when we may be out of stock either for a brief period, or permanently (discontinued line). If any of these circumstances arise, we will notify you within 48 hours. Well explain when new stock is due to arrive and if youre happy to wait. Some of our products also come with lifetime warranties, including our own handmade products. These are of exceptional quality and we have great confidence in all of them! Every order is rigorously quality checked and certified against damages, defects, and imperfections before we send them out to you. So, you can be rest assured that weve always got you in mind. For us to grow, we must earn your trust pure and simple. In todays world, data misuse is becoming more and more common, a factor that discourages people from shopping online. Many big corporations can now retrieve your personal information straight from your online shopping and browsing habits and can even link up to your social media accounts: they then work out your personal preferences and formulate marketing information specifically tailored for you all without your knowledge or consent. Thats why we undertook rigorous training through the Greater Manchester Chamber of Commerce for the May 2018 implementation of the General Data Protection Regulations (GDPR): the new set of regulations rolled out by the EU that replaces the Data Protection Act 1998. All the basic principles of the Data Protection Act remain within GDPR some of the main new features involve enhancing the enforcement of the previous laws effectiveness and requires you to give us explicit consent before we send you any marketing material. To reinforce your confidence in us, we are voluntarily registered as members with the Information Commissioners Office (ICO). We want you to be fully confident and rest assured that when you shop with us, we will handle your data professionally and securely, as explained in our Conditions of Sale. We will only send you any marketing information if you have explicitly and clearly consented us to do so. The All Things Furniture Co.
Ltd, is private limited company registered in the United Kingdom. Company Reg No: 9413798 VAT Reg No: 228942581. 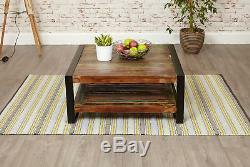 The item "Urban Chic Reclaimed Wood Coffee Table With Shelf Storage Large Steel Frame" is in sale since Monday, May 21, 2018. This item is in the category "Home, Furniture & DIY\Furniture\Tables\Coffee Tables". 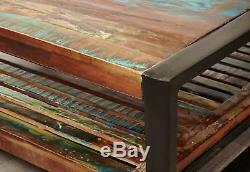 The seller is "theallthingsfurniturecompany" and is located in UK. This item can be shipped to United Kingdom.